[social_warfare]Have you thought about what you are going to share on your social media platforms or blog for the next few months? Have you even planned out the next week’s content? Content can take many forms – an image, a podcast, a blog post, a quote, a link to a news article -something that is of interest to your followers. How do you decide what content to create? And how do you organise sharing it with the right people? Let’s look at the steps involved. 1. You need to know who you want to attract. Sounds simple right? Imagine two people looking at your Facebook page where you have shared a positive news article about wind farming. One of those people is pro-wind farms, and the other campaigns against them. Which one are you trying to attract? Create, collect and share content that is going to appeal to YOUR ideal customer. 2 Be consistent. This is where content calendars and schedules come into their own. If you want to attract and keep your audience interested, you have to keep providing the same good stuff that brought them to you in the first place. So plan it out. Remember also, that the person looking at your Twitter feed at 10am on a Tuesday is not the same person looking at your Twitter feed at 8 pm on a Wednesday. Once you create your content, you can re-use it and keep sharing it on your social media platforms over and over. This works especially well if you have a wide variety of content to share. I don’t suggest you share your own three blog posts every day! 3. Use the 80-20 rule. This means that 80% of the content you share should be informative, entertaining, challenging – or whatever appeals to your audience – and 20% of it should be sharing directly your own products or services. When we are talking about content, for the purposes of this blog post, we are looking at social media sharing. So be social! 4. FInd out when the important or relevant dates are in the annual calendar that apply to your industry. If you are a florist, don’t miss Mother’s Day! You can easily find the days of the year with a quick search on Google. Mark them down in your own calendar with a reminder a month ahead – or print out a list and stick them on your office wall so you don’t forget. 5. Make sure you are covering the big questions your audience have. If you have a Facebook group or participate in one where your ideal clients hang out, see what questions they are regularly asking. If you work one-to-one or host workshops, take a note of the most common questions you are asked. 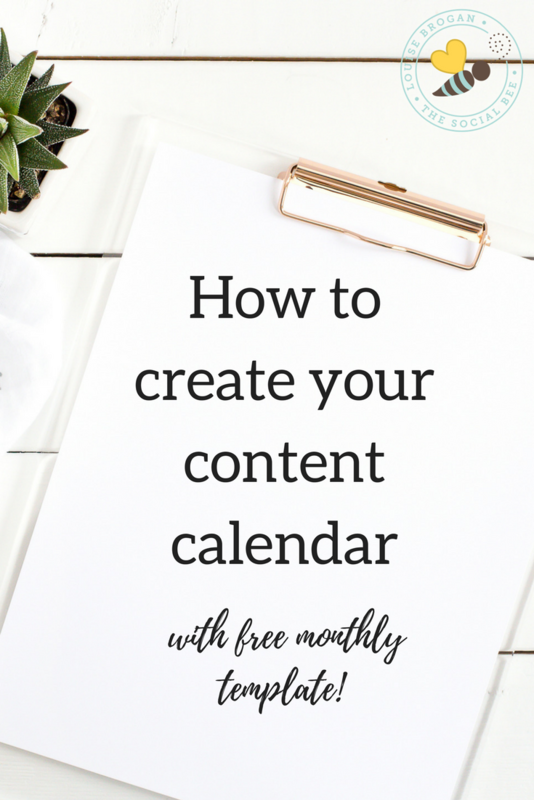 This is what you will write about on your blog and share on your content calendar. 6. Review past content and see what works well for you. If you have a Facebook page, see what the most popular posts have been.If you have a blog, which posts have the most shares or comments? A big mistake a lot of entrepreneurs make is posting all their content out and never reviewing their analytics. Most of the social media platforms make this quite simple – from Facebook Insights to Twitter Analytics – take a moment each month to check what is working well, and provide your audience with more of the same. 7. Use a third-party software tool to help you schedule across your networks. You can schedule your posts for Facebook inside the platform itself – or you can use a tool such as HootSuite, Buffer, MeetEdgar, Loomly… there are lots to choose from. These tools make it easier to set up your posts in advance in batches. Make sure you use appropriately sized images for each different platform – Canva can help with this. The first step in all of this is to get started. Start creating your content, start sharing it, and keep reviewing it until you have a system that is working for you and bringing in new business on a regular basis. 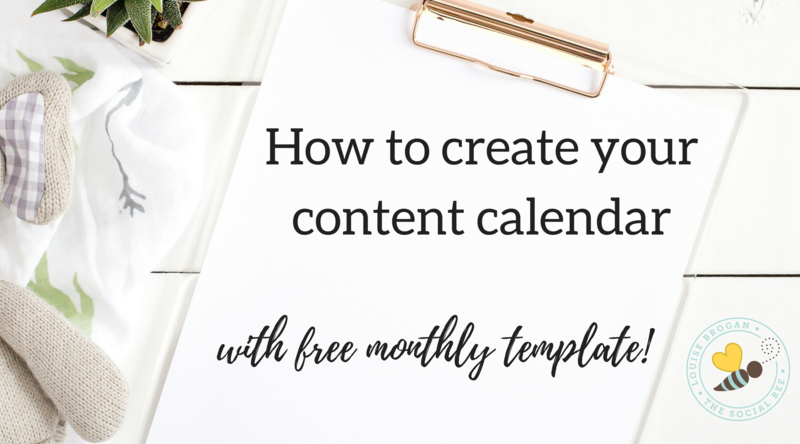 To start you off, here is a monthly template for your social media content calendar. Success! Now check your inbox to receive your calendar.